Here are even more reviews of Streamline Pictures’ video releases. 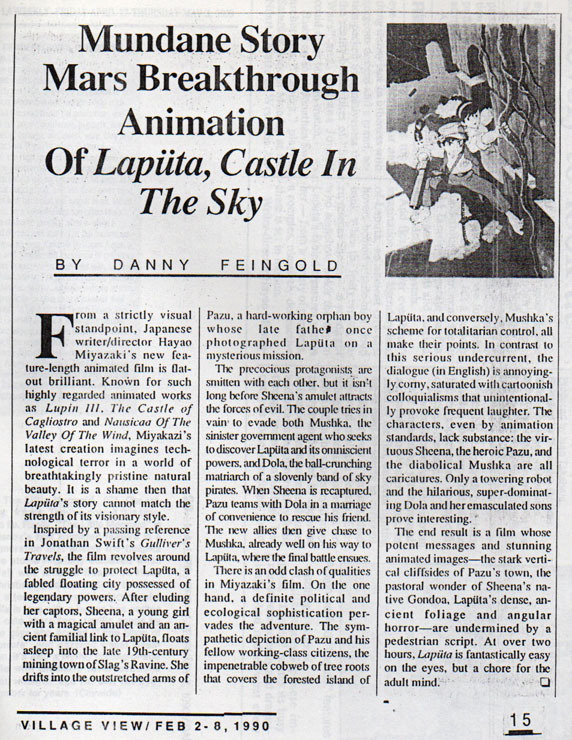 These are being posted mainly for my reference purposes, but they should be of interest as they recall some of the earliest serious commentary about anime published back in the 1990s. “The Chinese, by and large, look upon history as a series of cycles which is reflected within their culture by various changes in political, philosophical, religious, and/or military thought. The second century A.D. was the cusp of one of these great changes, when the old dynasty of the later Han Emperors began to be swept away.” “While there is a good amount of dialogue and character development in the movie, fans of action, blood, and fighting will not be disappointed. 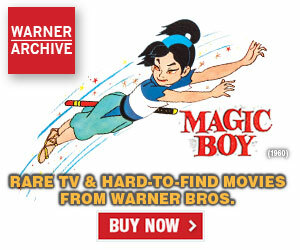 This film, if it were live-action, would be classified as a martial arts film. 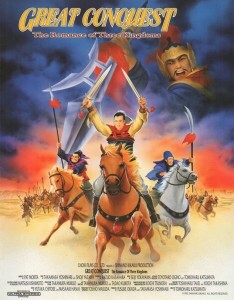 In fact, it is a Japanese animated Chinese historical drama, much the same as Like the Clouds, Like the Wind. 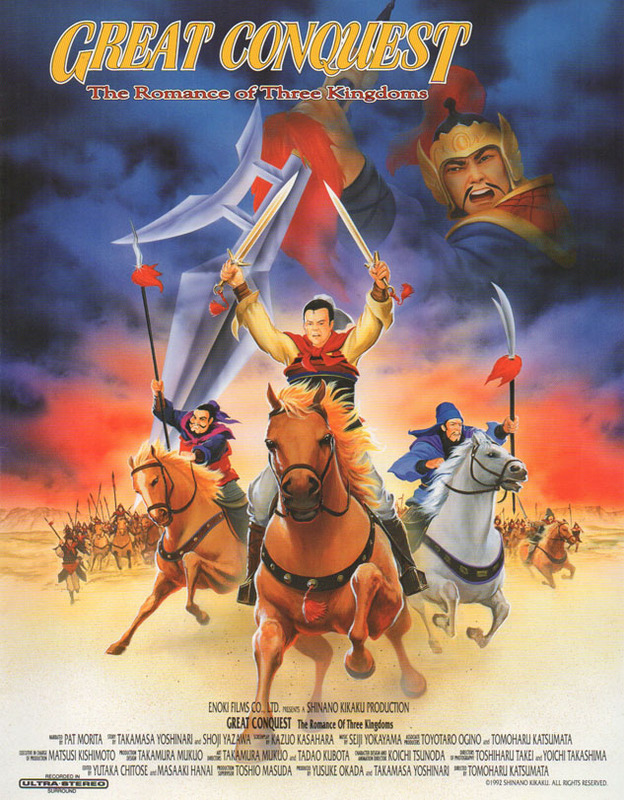 The English dubbing, music, and production quality of Great Conquest are much better than in any ‘martial arts’ film, and indeed better than in many of Hollywood’s animated or live-action efforts. unsigned, Persistence of Vision, #1, June 1995, pg. 11. Dave DeNeal, The Bellingham [Wash.] Herald, November 14, 1990, pg. ? Robert Garrett, Boston Globe, June 16, 1989, pg. ? “In a review of a much-anticipated, full-length, animated film from Walt Disney Studios released last year, we made the mistake of comparing the less-than-memorable result to the unambitious cartoons churned out by the Japanese. The ink was barely dry before we began to receive calls and letters from irate aficionados of Japanese animation art, many of who were polite enough to point out that while much of the Japanese animation routinely shown on Saturday morning television is indeed substandard and static, there are also some extraordinary animated films being produced in that country, few of which make it to American shores. 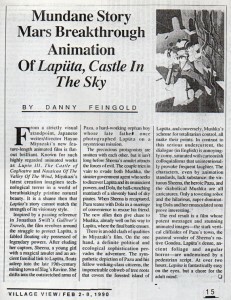 And now we have some indisputable evidence, in the form of Laputa, Castle in the Sky, an exquisitely crafted, honestly exciting fantasy adventure that manages to hold our attention for its entire two-hour running time, a length even Disney has never attempted. 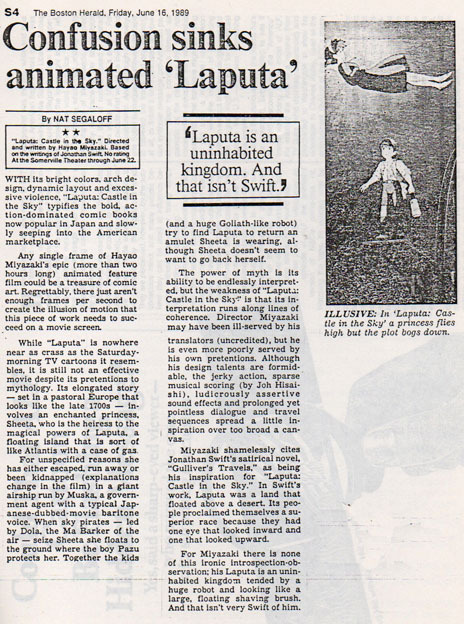 […] Original in conception and style, Laputa could take Japanese animation out of the basements and rec rooms where its admirers now congregate, and into the entertainment mainstream. Steven Rea, Philadelphia Inquirer, March 24, 1989, pg. ? 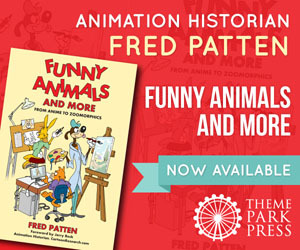 Review from the L.A. VILLAGE VIEW in 1990. 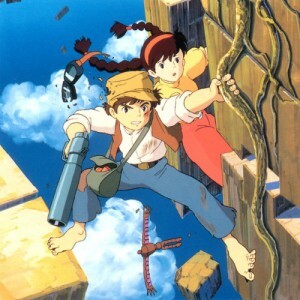 “‘Laputa: The Castle in the Sky’ is an exceptional example of Japanese animation, though this one is primarily a film for children. […] ‘Laputa’ has moments of great charm mixed with major bouts of menace. Very young children might be frightened by the pirates, who turn out to have kind hearts. But most children will be awed by the imagination writer and director Hayao Miyazaki employs in this colorful and extremely well-made two-hour film. Marylynn Uricchio, The Pittsburgh Post-Gazette, May 19, 1989, pg. ? Ed Blank, The Pittsburgh Press, May 26, 1989, pg. ? The first review, of “Great Conquest”, mentions “Like the Clouds, Like the Wind”. Did anyone ever release this made-for-TV movie in America? Streamline tried to get it, but this was one of the too-expensive titles. I’ll cover it in a future column. That is very repulsive to read. Was it really hard for that guy to follow the movie? BTW Fred, while I don’t know if you’ve ever kept such records or not pertaining to which theaters/locations Streamline’s releases were sent to, I don’t suppose if you remember if any of these managed to make their way to my neck of the woods? (Toledo, OH) I’m sure they didn’t, but I do recall hearing someone tell me he remembers seeing Akira once in 1990 somewhere in town. Jerry Beck would have to answer that question. I only copied the records for the first bookings of Streamline’s titles. Great Conquest wasn’t TOO bad for a dub by Streamline, but the ’80s version of Laputa was terrible. Compared to even today’s dubbing, it sounds very emotionally devoid and robotic, with no one turning in the way of memorable performances. The scripting was terrible as well; lots of choppy-sounding phrases and lines throughout. That said, I know Macek and company had nothing to do with that particular dub. It was clearly dubbed on the cheap. Disney’s version is much better overall, despite the leads sounding more like teenagers and the script being a bit more talkier, the performances are stronger, and of course it helps that Mark Hamill and Cloris Leachman steal the show.